Landing on a sunny fall afternoon in Chiang Mai is a breath of fresh air after the overwhelming sensory overload of Bangkok. Spread across a valley framed by steep, verdant hills, Thailand’s third largest city is a mosaic of contemporary buildings and the elaborately gabled roofs of its some 300 Buddhist temples (or wats). At the heart of this panoramic vista, a 2000-meter (1.25-mile) square medieval moat surrounds what was once the capital of an ancient state that spread from eastern Burma (also known as Myanmar) to the western valleys of Laos, the Lanna Kingdom. Si Phum Corner is one of the recently restored bastions in the Old City fortifications. Founded in 1296 A.D., Chiang Mai (new town in Thai) quickly became an important cultural and religious center. It also prospered as the main trading hub between southern china and the seaports of Burma. Until successive military invasions by its neighbors set off its decline and ultimately caused its rulers to abandon the city in the eighteenth century. Far away and hard to reach from Bangkok 430 miles (700 kilometers) to the south, Chiang Mai became an overlooked provincial town in the foothills of the Himalayas. This helped preserve its cultural legacy and laidback charm until it was re-discovered by late-twentieth century tourists. Today, it is considered the cultural capital of Thailand. Little remains of the walls that once rose behind the moat, other than the four entrance gates and corner bastions that were extensively restored a few decades ago. But within the ancient perimeter, the medieval heydays of the Lanna Kingdom endure, with over thirty wats and their adjoining monasteries, a reminder that Chiang was and remains an important center of Buddhism. The golden chedi of Wat Chiang Man is supported by 15 life-size elephant carvings. Wander around the maze of narrow side streets of the Old City, lined with homes and every manner of small businesses. Between browsing for local crafts and sampling the offerings of the ubiquitous food stalls, you are sure to come across some of the most ancient and revered wats in the city. The most visited are Wat Chiang Man, the oldest in Chiang Mai, constructed in the early fourteenth century during the reign of King Mengrai, who lived in the temple while overseeing the construction of his capital, and Wat Phra Singh. Heavily damaged in 1545, the monumental ruin of Chedi Luang remains the most iconic image of the Old City. Built in the latter part of the fourteenth century, Wat Prah Singh houses Phra Chao Thong Tip, the most venerated Buddha statue in northern Thailand, made of an alloy of gold and copper, cast in 1477. Equally prestigious is the nearby Chedi Luang (royal chedi, or pagoda), once part of the official temple of the Lanna kings. Built as a reliquary to house royal ashes, Chedi Luang grew to be 144 feet wide and 282 feet tall before being heavily damaged by an earthquake or invaders (or both, depending on who you ask) in the mid-sixteen century. Its imposing ruin remains an iconic structure in Chiang Mai. The front gable of Wat Pan Tao is an intricate metal and glass plates mosaic evoking the zodiac sign of its original occupant. My personal favorite, however, is the nearby mid-nineteenth century Wat Pan Tao, for its stark viham (main assembly hall) made of ancient teak. It was originally constructed and briefly used as a royal residence for the then local ruler, Chao Mahawong before being refurbished as a monastery in 1876. But traces of its previous purpose remained, especially the unusual front gable of the temple, decorated with the image of a peacock over a sleeping dog (the zodiac symbol of the king’s birth year). The monument of the Three Kings is a popular meeting point in the center of the Old City. When you need a break from all this temple hopping, the Chiang Mai City Art and Cultural Center, located in the old town hall, features permanent exhibits that touch on all aspects of Chiang Mai’s history, people and culture. And right in front of the building you can’t miss the large bronze statue of the Three Kings. No, not those three kings. This monument pays homage to the founding fathers of Chiang Mai, King Mengrai and his two friends King Ramkamhaeng of Sukothai and King Ngam Muang of Payao who, according the city lore, worked together to create the city. For those interested in the evolution of the unique northern style of building design, the Lanna Architecture Museum is located on Rajdamnoen Road, just a few minutes’ walk away from the Three Kings. Sunday Walking Market merchants get ready for the onslaught of locals and tourists. A colorful Chiang Mai tradition, the Walking Market unfolds every Sunday from late afternoon until midnight along the whole 1.2-kilometer (4,000 foot) length of Rajdamnoen Road, the Old City’s main east-west axis. The street is closed to traffic then and becomes a street bazaar that offers a vast range of local handicrafts, clothing and bric-a-brac. Food stalls set up shop in the courtyards of the temples, and with five of them along Rajdamnoen Road, including Wat Prah Singh, there are plenty of opportunities to sample real Northern Thai food. It’s a favorite spot for local people to browse and socialize as well as for tourists, and by early evening it becomes seriously crowded. As for the shopping? It takes a bit determined browsing and friendly bargaining, but some quality items can be found at very reasonable prices. Getting There – Chiang Mai is easily accessible from Bangkok via multiple airlines, with departures throughout the day from both Suvarnabhumi Airport, also known as (New) Bangkok International Airport and Don Muang International. The latter is now used mainly by low cost airlines. The flight takes 60 to 70 minutes. Getting Around – the Old City is a compact, near perfect square. Distances between two points are rarely more than a 30-minute walk. And with so much to see along the way, the best way to get around is by foot. But if you don’t feel like walking, tuk-tuks are for you. These three-wheel open-sided taxis are lined up near all the tourist areas. The cost varies with your destination and bargaining talent and can be anything within the 50 to 100 THB (one-twenty-five to three dollars U.S.) range. For the daring souls, there are songthaews, the red pickup trucks that are the standard means of travel for locals. You can wave one down anywhere, as long as it’s headed in your direction. The driver normally doesn’t speak English so you need to give him a reference point. When you see your destination, just ring the bell to stop the truck. The price is 20 THB (fifty cents U.S) within the Old Town and a few kilometers out. It then increases the farther you go. Where to Eat – Anywhere! Thailand is famous for it cuisine bursting with flavors and spices, but Chiang Mai is a foodies Nirvana. From sai ua (spiced lemongrass sausage), a Chiang Mai signature dish from a stall at the market, to the perfectly grilled mu ping (pork skewers) stand, and the ubiquitous bowl of khao soi, soft cooked egg noodles and minced chicken, served with a mild, coconut-based curry and topped with crisp fried noodles, it never tastes quite the same twice but it’s always wonderful. Then there are all the restaurants where a new generation of chefs blends traditional local flavors with touches from the world over for extravagantly delicious fusion dishes. The main dilemma is that you can only eat so much in one day. Visiting – Most wats are open from early morning to late afternoon. Whenever you pass a one that looks interesting, just take off your shoes, step over the threshold (not on it) and walk in. You will be welcome and you may find that the monks and novices are often glad to speak with foreigners (and practice their English). However, make sure you are dressed appropriately. Tops should cover your shoulders and bottoms should reach your knees. Shopping – Remember to bargain for your purchases, it is expected of you and it’s all part of the fun. Good-humored bargaining is practically a national sport in Thailand. Even though the prices may appear quite reasonable by your normal standards, you should always bargain and try to get at least another 20 to 25 percent off the asking price. 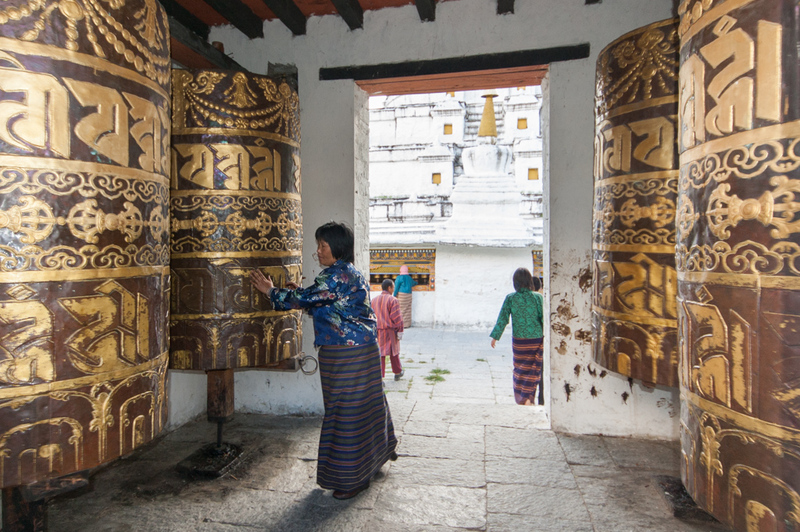 We are entering the final week of our itinerary around Bhutan. From Tashingang back to Mongar over Thrumshing La pass toward Jakar, we are retracing our steps on the only main road that runs the breadth of the country and will ultimately take us back to Paro. On the second day of this westward drive, we turn onto a side road that leads to the highest valley in the Bhumthang district and the village of Ura (altitude 3,200 meters or 10,170 feet), where we will be the overnight guests of a local family. The people in this remote rural community are mainly sheep and yak herders, and believed to be the descendants of Bhutan’s earliest inhabitants. The home of our local hosts in Ura. While our hostess prepares the evening meal, our guide Kezang encourages us to explore the village, partially to pre-empt any offer of help in the kitchen, I suspect. The ensuing walk is one of my most memorable moments of the entire trip. Time seems to have forgotten this cluster of ramshackle Himalayan farmhouses scattered along narrow cobblestone lanes and dominated by a modest temple. Under a crystalline blue sky the high altitude air is thin and crisp. A light breeze carries the sound of a nearby rushing stream and a faint smell of wood fires. We pass a few villagers, a woman bringing in her cows, a young boy carrying on his back a large bale of hay. Soon the pale sun drops beyond the mountain range and dusk instantly engulfs the village. The remote village of Ura offers a glmpse of Hymalayan rural life. Suddenly the air vibrates with the soaring baritone wail of Dungchens, the giant horns used in Buddhist ceremonies, punctuated by the deep beat of drums coming out of a nearby barn. Male voices join in. The sound stops abruptly, only to start again an instant later. We stand still, mesmerized by this unexpected gift of music from what we surmise to be a rehearsal, until a rumble of hooves gives us notice to get out of the way. Four long-haired yaks, squat and powerful, barrel by on their way to the river. I am awed by this fleeting experience of the essence of Bhutan. Our Ura host family’s kitchen. We share a traditional meal of red rice, dry yak meat stew and hot chilies in a cheese sauce with our host family, all of us sitting in a circle on a floor mat in the center of the kitchen, exchanging questions about each others’ world under the vacillating light of a small light bulb. Kezang translates. We are in the home of a local state official, one of the most spacious and best kept in the village. However creature comforts as we westerners understand them are still a relative concept. Other than the warmth from the woodstove in the kitchen, the house is unheated, and the temperature has dropped precipitously at nightfall. In my room, a glaze of ice is forming on the window panes. I gratefully burrow in the low temperature sleeping bag I have (needlessly until now) dragged around the country. Plumbing is symbolic here, with a common water closet consisting of a sink, a commode and a large drum of (ice cold) water with a scooper. All and all a unique opportunity to experience authentic Bhutanese village life. 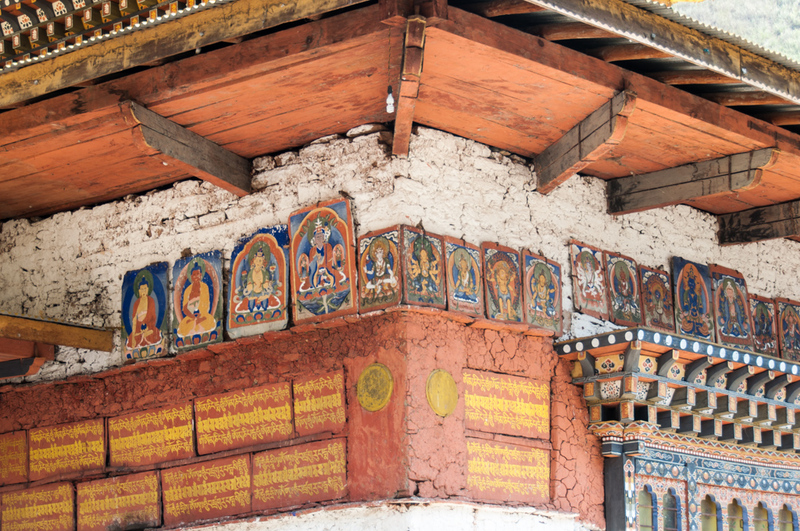 Recently restored Gangtey Gompa monastery features exceptional wood facade details. We continue our exploration of the high valleys and rural life with a stop in Phobjkha Valley. The weather is clear and we get exceptional views of the Black Mountains range along the way, with several snow-covered peaks rising above 5,000 meters (16,000 feet). Phobjkha is a vast U-shaped glaciated valley known as the winter habitat for black-necked cranes. Unfortunately we are a couple of weeks early and the famous Himalayan migratory birds have yet to return from Tibet. Absent cranes notwithstanding, we enjoy sunny nature hikes in the valley, and visits at various times of day to the nearby Gangtey Gompa. 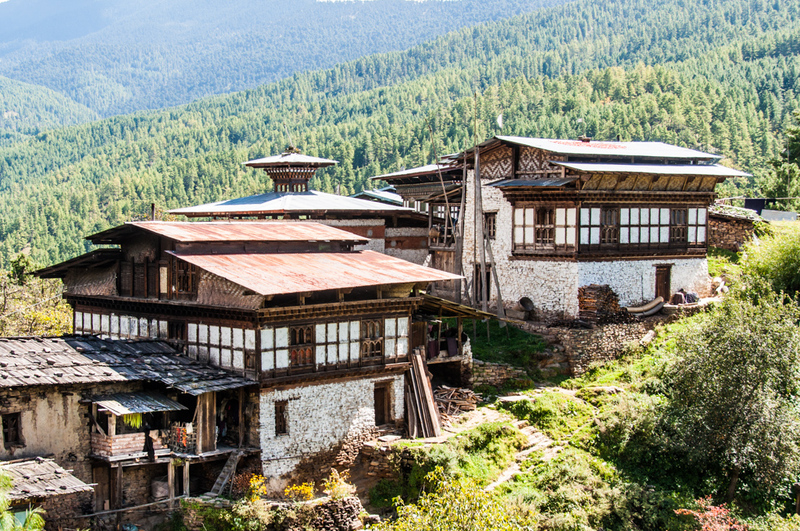 This monastery, one of Bhutan’s oldest was recently the object of extensive renovations. The woodcarvings of the façade and the vivid murals inside are exceptionally beautiful. We go over Dochu La pass, once again cocooned in thick clouds. We are now inexorably on the road back to Thimphu. The capital of Bhutan is a mere 30 kilometers (19 miles) southwest of here, with Paro only one hour farther via the best stretch of blacktop road in the country. 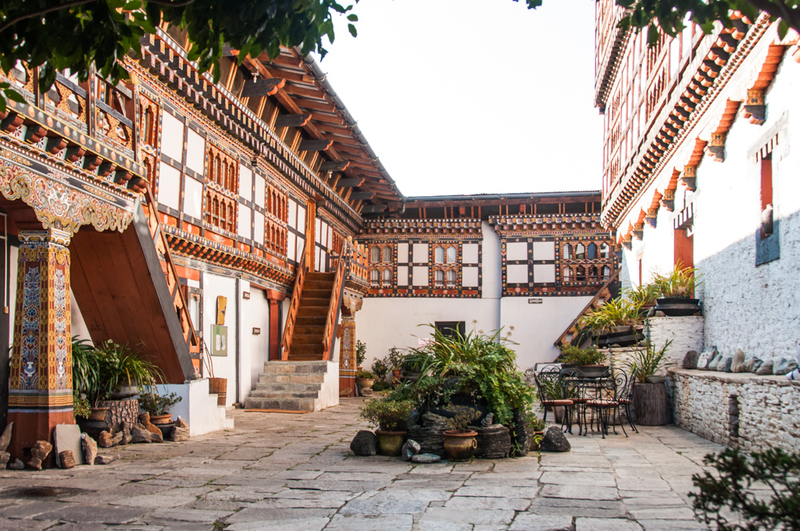 Inner courtyard of the Gangtey Palace Hotel, once a royal residence in Paro. In Paro, thanks to Karen’s determination, we stay in glorious splendor at the Gangtey Palace Hotel. The palace was built over a century ago for Dawa Penjor, uncle of the first king of Bhutan and governor of the Paro Valley. It was also for a time the residence of the king when he visited the city. In addition to its traditional décor and gorgeous antiques the palace offers a stunning view of Rinpung Dzong (or “fortress that sits on a heap of jewels”). 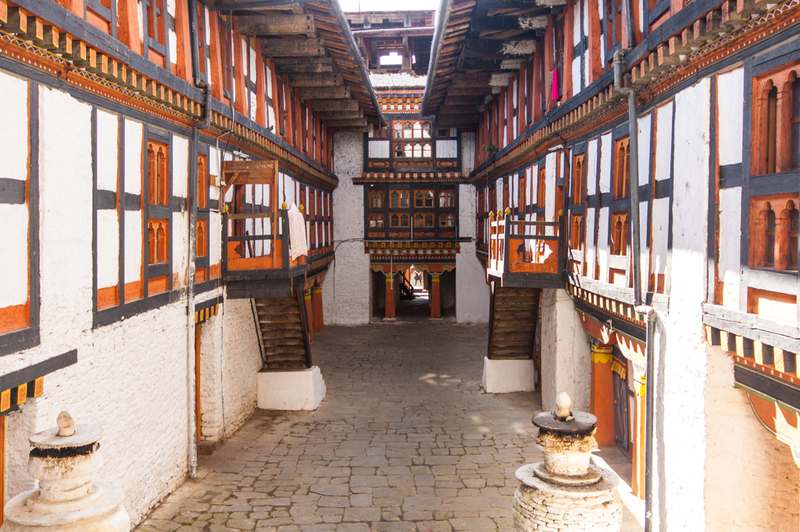 More commonly known as Paro Dzong it is itself a jewel of Bhutanese architecture with its high inward-sloping walls rising high above the Paro River. The Tiger’s Nest monastery overlooks the Paro Valley. On our last day in Bhutan, we visit the Taktsang Palphug Monastery. Better known as the Tiger’s Nest, the temple complex was built in the late seventeenth century on the site of one of Guru Rinpoche’s meditation caves. 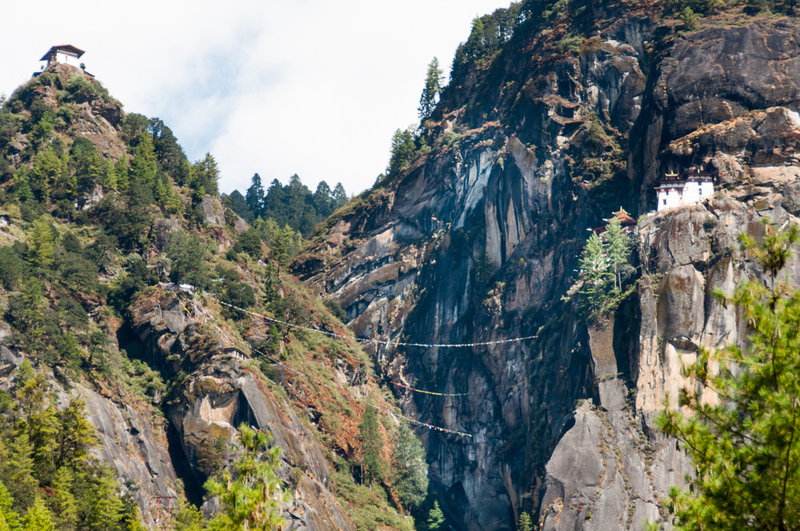 This sacred site clings to a vertical rock face about 900 meters (3,000 ft) above the upper Paro valley. The eight century holly man is said to have been transported here on the back of a flying tiger. With no such conveyance at our disposal, the only option is to hike up, with the possible assistance of a sturdy Himalayan pony for the lower half of the trek. Jan takes off on foot. Karen and I opt to admire this iconic architectural wonder from afar. Tourism in Bhutan is subject to strict regulations that are managed by the National Tourism Council of Bhutan. All travel within the country must be planned and booked through a tour operator registered with the council. Travel guidelines as well as a complete list of registered tour operators and the yearly festival schedule are available on the council’s website: http://www.tourism.gov.bt/plan. 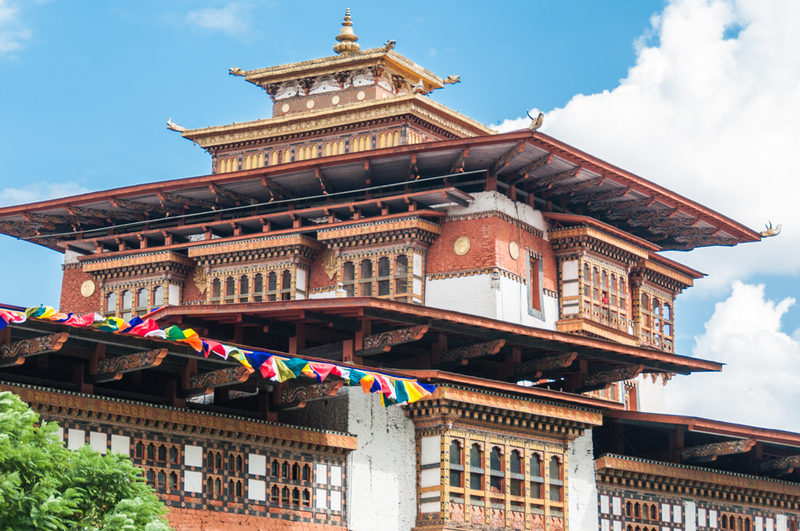 We selected Blue Poppy Tours and Treks http://www.bluepoppybhutan.com for their responsiveness in tailoring a tour to our personal interests and requirements. I want to express my profound gratitude to my friends Karen and Jan Abadschieff who planned this amazing adventure in the Land of the Thunder Dragon down to its smallest detail and welcomed me to share it with them. As the tiger flies (in Bhutanese lore, tigers do more than their fair share of flying. Why should crows have all the fun anyway?) the distance between Jakar, capital of the Bumthang district in central Bhutan and Mongar, gateway to the eastern part of the country, is approximately 57 kilometers (35 miles). For humans however, the only option is a 200 kilometer (125 mile), daylong roller-coaster road trip that includes a steep ascent to Bhutan’s highest pass, Thrumshing La (altitude 3,780 meters or 12,402 feet). Roadside shrine near mountaintop Thrumshing La Park. Before entering the Thrumshing La National Park, we make a quick stop at a roadside teahouse. A small adjacent one-room temple is aglow with flickering butter lamps. Considering the road conditions, it seems a wise idea to make our own offering. Thrumshing La is the highest pass in Bhutan. As we near the pass, the stunning panorama of distant snowcapped mountains vanishes. By the time we reach the top, we are deep in shifting clouds that go from gloomy gray to gleaming white as they part to allow us glimpses at the bottomless valley below. Hundreds of prayer flags snap in the cutting wind. The landscape is breathtaking, the ride hair-raising. We leave the Thumshing La Park area to emerge into the upper Kuri Chu valley. The narrow road has been hacked into the side of a vertical rock face streaked with waterfalls that thunder straight down for hundreds of meters and sometimes spill onto the road. Then there is the occasional rockslide. We stand by and watch while our driver Tshering takes the van at crawl speed over whatever rock and dirt are obstructing the way. He once explained that he had grown up in a monastery. I hope he accumulated enough divine protection in his youth to see him through. He has. We get back into the van and continue on our way. 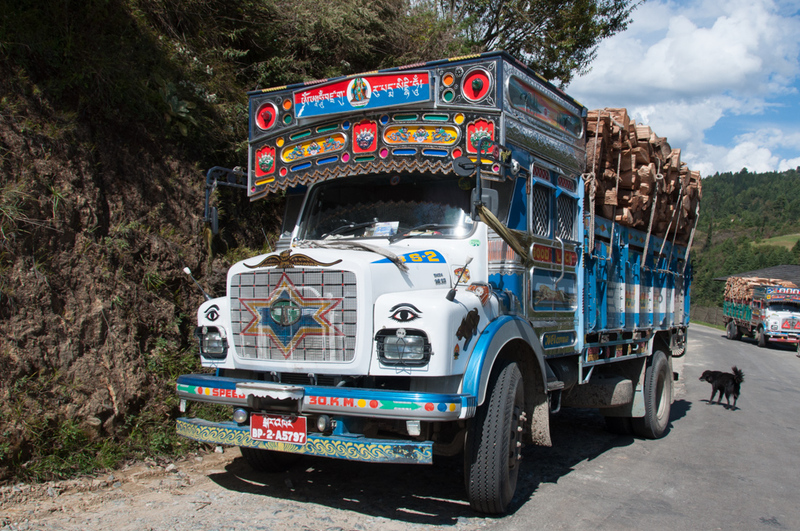 Other than local busses, we mostly meet the ubiquitous huge, brightly painted trucks used to move every imaginable kind of freight across the country. Crossing path with them is always a tight squeeze, and guardrails are still a remote concept in these parts. Local farmers sell their produce at an impromptu roadside market. We wend down an endless succession of sharp turns. The vegetation becomes lush with giant bamboo and ferns. “This is panda country,” our guide Kezang volunteers, but the legendary bears are nowhere to be seen. The temperature warms noticeably as we continue our descent through cornfields, rice terraces and tropical fruit orchards. 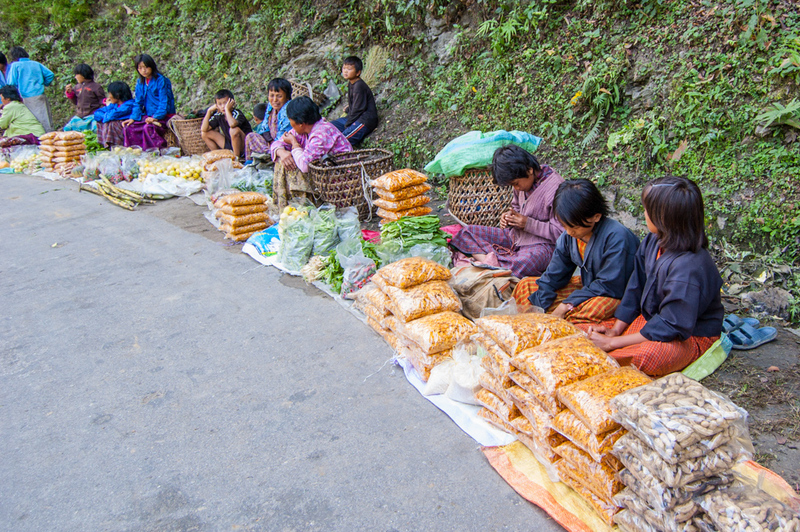 At an unusually wide curve in the road, local villagers have lined up to sell their products. We stop at this impromptu roadside market for a bag of juicy persimmons. 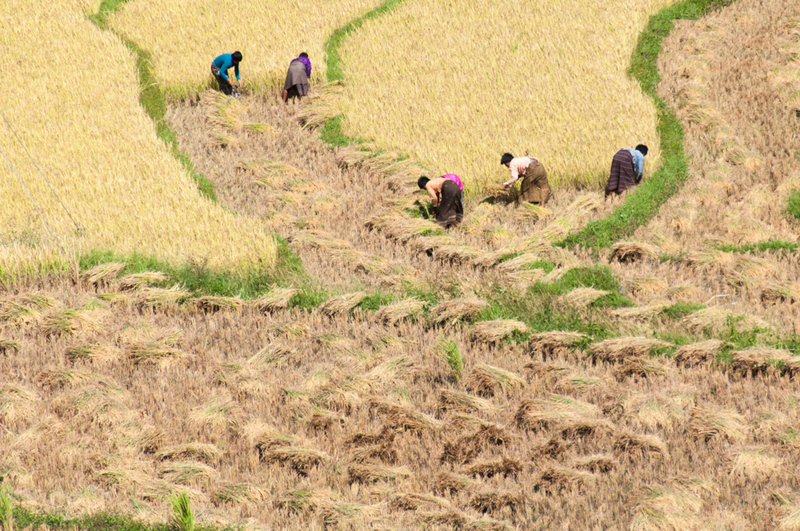 In the valley below local women harvest the rice . We finally reach the valley floor (altitude 570 meters or 1,900 feet) and the Kuri Zampa bridge that takes us across a white-water river to start the hour-long, 25 kilometer ascent to Mongar (altitude 1675 meters or 5500 feet). This fast-growing, unlovely modern town is notable only for the medical facility built a couple of decades ago to serve the people of eastern Bhutan. In Tashi Yangtse, we join the villagers at the Chorten Kora. The next morning, we are on our way to Tashi Yangtse, as far East as one can travel and still be in Bhutan. Very few western Bhutanese and even fewer western visitors make it this far. There is no tourism infrastructure here, so we are welcomed for the next two nights in the home of a lovely elderly woman, where guest quarters have been arranged, complete with basic modern plumbing. This small rural town near the border of the Indian state of Arunachal Pradesh is gathered around the large white-washed Chorten Kora, a serene sanctuary on the bank of the Kulong Chu river. At dusk, we join villagers and a handful of pilgrims in their daily perambulations around this revered site. The next day, we enjoy a hike in the countryside, a visit to the local monastery and a welcome rest before departing for nearby Tashigang in the morning. Gom Kora temple is built around a sacred cave. We stop on the way at the temple of Gom Kora, built in the seventeenth century in front of a rock where Guru Rinpoche is said to have meditated and left his body imprint. The temple is home to 30 monks and what are considered to be some of the most beautiful paintings in the country. The eastern-most point on the main road, Tashigang is a bustling city. Area residents come to trade here, and there is a busy station where busses leave several times a day for Thimphu and Paro in the west, and for India only a few hours to the southeast. Tomorrow we start our own long journey back to Western Bhutan. It’s only 130 kilometers (80 miles) from Wangdi to Trongsa, the geographical center of Bhutan, but the drive takes a solid five hours of hairpin turns up and down a narrow and improbably steep road. Two-third of the way to Trongsa, on a rare stretch of flat road, we make a short stop at the Chendebji Chorten. 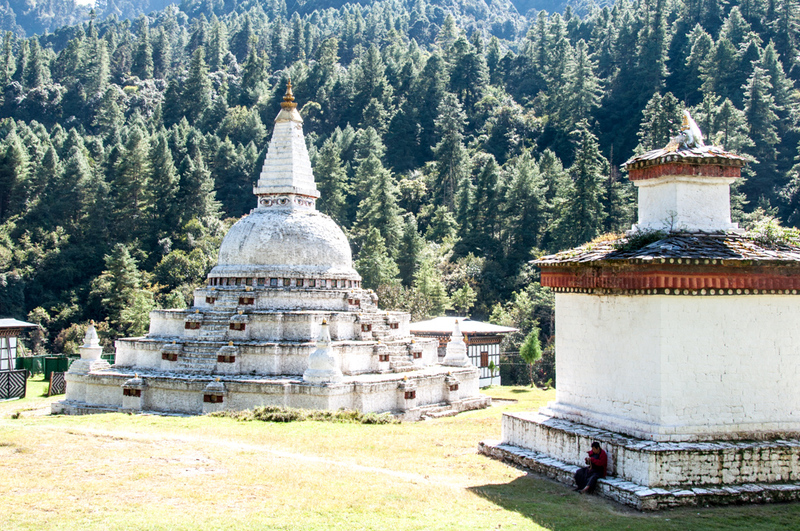 A chorten, sometimes also called stupa, is a dome-shaped monument topped by a sharp cone, used to house relics or commemorate significant events of Buddhism. The nineteenth century Chendebji Chorten is a replica of the Swayambhunath Chorten in Katmandu, Nepal. Our guide Kezang explains in approximate English that this particular chorten was built in the nineteenth century, recenctly by Bhutanese standards, to cover the remains of an evil spirit that was overpowered on this spot. It is remarkable for its imposing size, and for being a reproduction of the Swayambhunath Chorten in Katmandu, Nepal. As Kezang has it, every milestone of Bhutanese Buddhism involves the subjugation of some seriously evil spirit by Guru Rinpoche (or Precious Guru, the patron saint of Vajrayana Buddhism that is practiced in Bhutan) or his disciples, sometimes with the cooperation of other helpful deities temporarily incarnated as flying tigers and such. The Trongsa Dzong and Da Dzong watchtower overlook a deep gorge of the Mangde River. 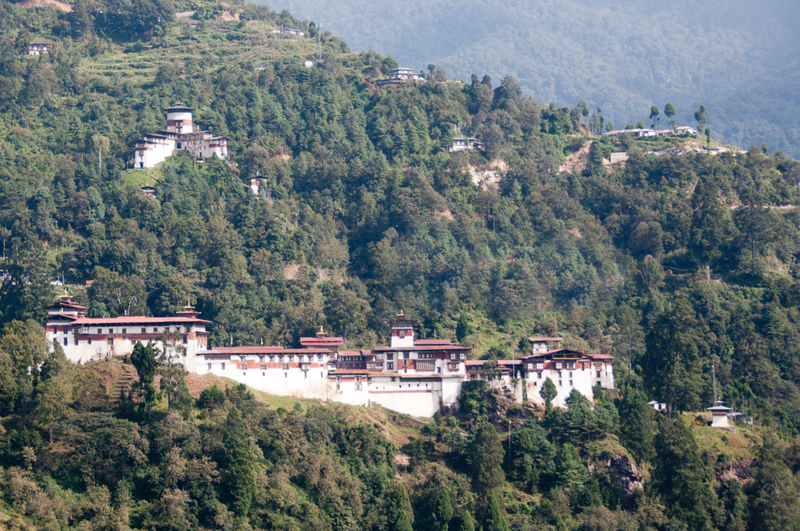 Trongsa Dzong, the largest fortress in Bhutan, is built on a spur overlooking a deep gorge of the Mangde River. Its massive exterior walls hold a maze of vast courtyards surrounded by temples, administrative offices and living quarters for its 200 monks. Further up the mountain a watchtower, Da Dzong, rises from the treetops. 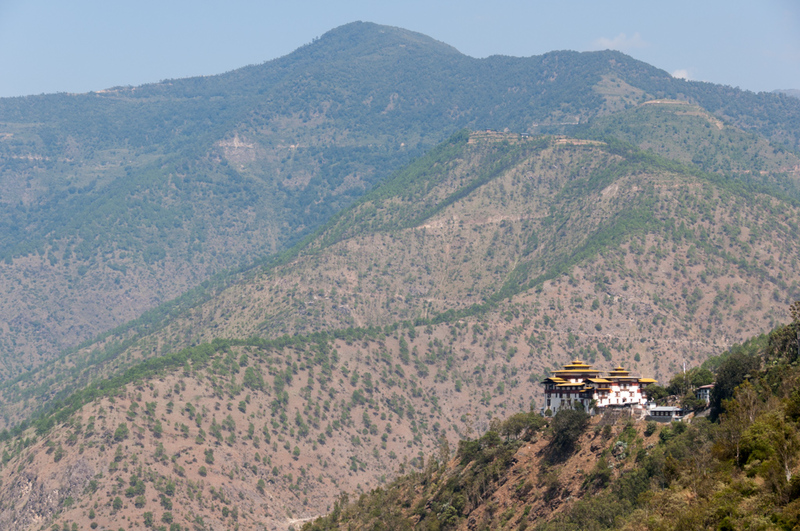 The view goes on forever, from the sky-high mountain range to the bottom of the gorge, a striking reminder of the dzong’s original strategic purpose. 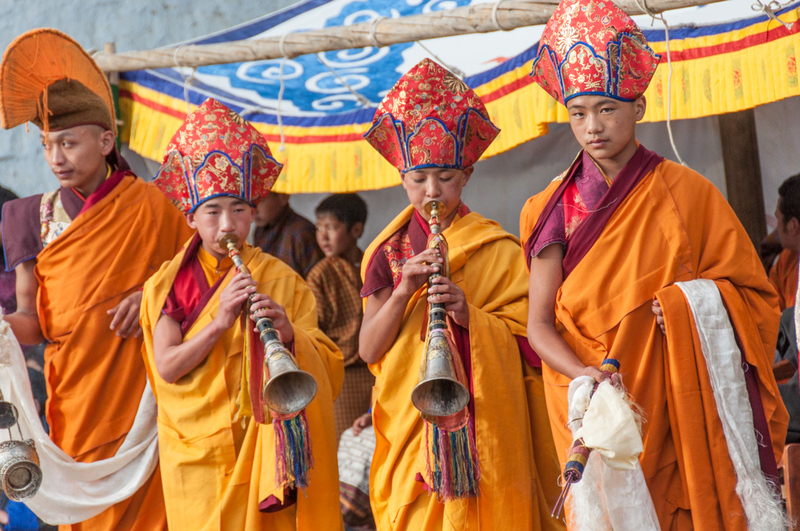 Musicans at the Bhutanese lingm flute as the Tamshingphala Festival. The next afternoon finds us at the annual Tamshingphala Festival. In the courtyard of this small fifteenth century monastery, monks and a multigenerational crowd of area villagers are gathered around an open space where dancers in ornate robes twirl wildly to the sound of ancient horns and cymbals. Evil spirits and other ill-intended demons don’t stand a chance. We are in the Bumthang district now, the spiritual heartland of Bhutan. The landscape is dotted with legendary monasteries, temples and palaces. We are staying in Jakar, the district capital where there are unmistakable signs of development. Our hotel actually has, in addition to passable plumbing, a frequently operational Wifi in the dining room. And the owner is married to a lovely Indian woman who does the cooking, which means a nice curry break from the usual locally grown red rice and chilies (nb. 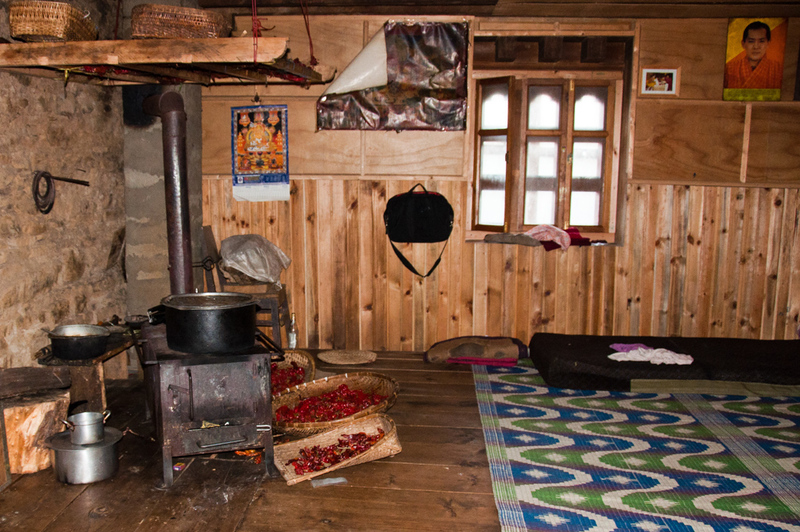 chilies seem to be a food group in Bhutan). The Kurje Lhakhang monatery is build about a sacred cave. Guru Rinpoche. In 747 A.D. the Buddhist saint came from India (where he was known as Padmasambhava) to Bumthang at the invitation of the local king who needed his soul retrieved from, you guessed it, a malevolent deity who had cursed him with a terrible illness. Guru Rinpoche meditated in a cave in Lhakhang, subdued eight classes of demons and restored the king’s soul. He then departed for Tibet, but left imprints of his body in the cave, which became known as Kurje (body imprints). 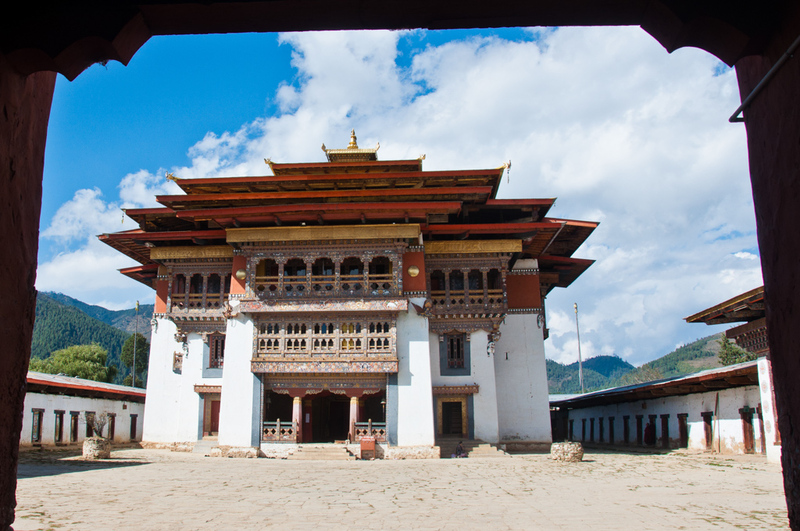 The Kurje Lhakhang monastery is a spiritual in Bhutan. Guru Rinpoche subsequently returned, set up his headquarters in Bumthang and Kurje Lhakhang (Temple of Imprints) became a major spiritual and historical site. There are three temples here, home to giant Buddhas and stunning ancient murals representing Taras (deities associated with wealth and fortune) and a 12-meter (40 foot) high statue of Guru Rinpoche that obstructs the Cave of the Imprints. Farmhouse in the most remote of Bumthang’s valleys. We take a side trip to Tang Valley, the most remote of Bumthang’s valleys, for a close look at rural life. This is a pristine agricultural area where the industrial age has yet to take hold. Farmhouses precariously cling to the mountain, and farmers work their land just as they have for many centuries. What starts out as a dubiously paved road soon stops all pretenses, and our van rocks gamely along the dirt trail until we come to a bridge. It’s on foot from here on, one hour uphill on a narrow path through fields and along a cluster of farmhouses. 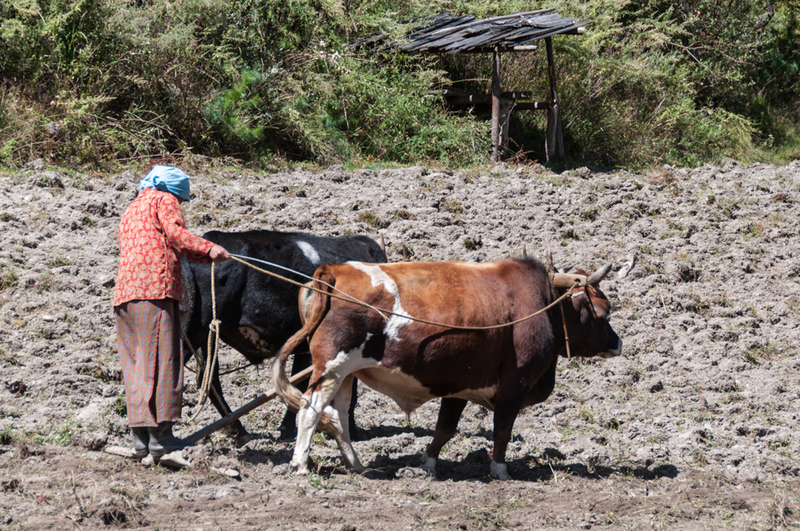 A woman leads an oxdrawn wooden plow in her Tang Valley field. 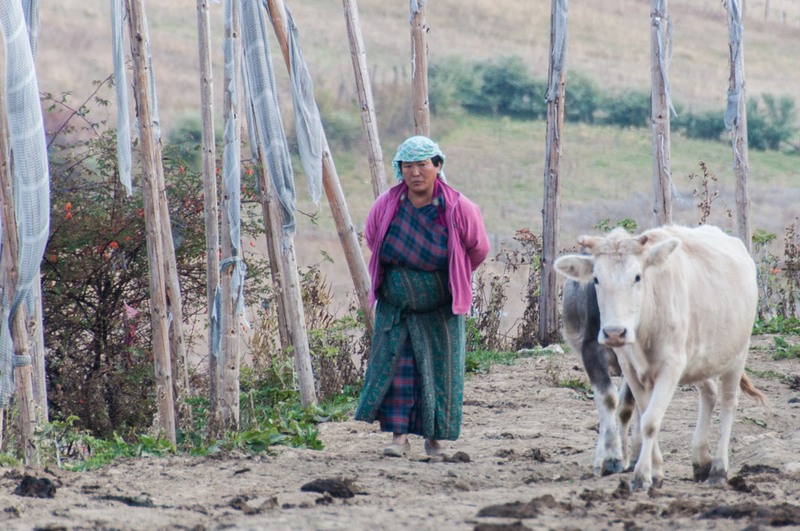 A woman guides a team of oxen pulling a wooden tiller across a terraced field. Others spread buckwheat out to dry or spin wool with a drop spindle. We eventually reach Ugyen Choling, a country estate built in the seventeenth century for a local noble family. Their descendants still own it and have transformed most of it into a museum. They have recreated traditional living quarters, including all the everyday objects necessary to sustain the household: kitchen and weaving utensils, tools, farming implements, weapons, as well as religious masks and a rich collection of printing blocks. 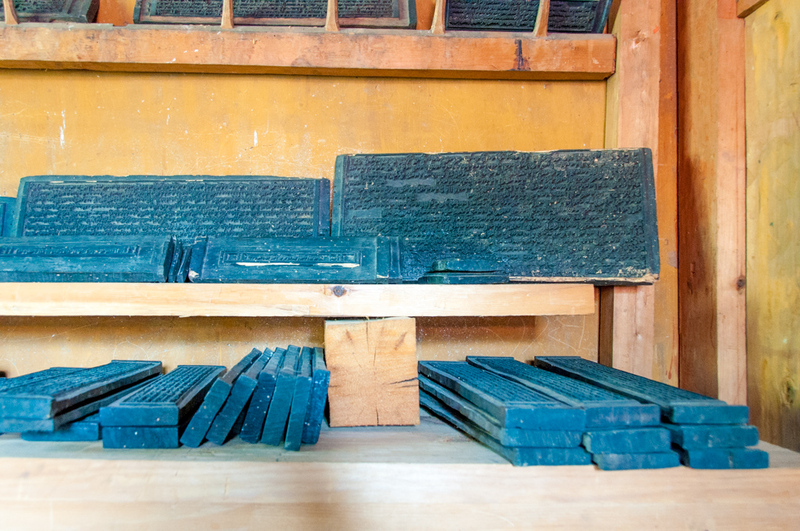 Once a self-sustaining remote country estate, Ugyen Choling has fine collection of rare printing blocks. It’s on foot from here to Tharpaling Gompa, a fourteenth century monastery (altitude 3500 meters or 11,500 feet) still home to 100 monks. The view of Bumthang valley from here is, quite literally, breathtaking. We then stop at the Burning Lake, which turns out to be a gloomy pool at the bottom of a narrow gorge of the Tang Chhu River. But great deeds are said to have happened here in the fifteenth century, involving a reincarnated disciple of Guru Rinpoche diving to retrieve a sacred scroll from the bottom of the pool and returning with his still burning butter lamp. Judging the thousands of Tsha-tshas (small prayer stones honoring ancestors) tucked under the ledge leading to the water, and the bridge disappearing under thick layers of prayer flags, the site is very holly indeed. Our next destination is Tashi Yangtse, about as east as we can travel without ending up in India’s state of Arunachal Pradesh. Apparently very few Western tourists make it this far. Religious Buddhist festivals (or Tshechu) are held yearly in each district of the country. Dates vary according to the Buddhist calendar. Wedged high in the eastern end of the Himalayas, between India to the south, east and west, and Tibet to the north, Bhutan is one the most isolated countries in the word, and the last remaining Buddhist kingdom. Tourism was not permitted until 1974. Television and Internet access did not appear until 1999. Druk Yul (or Land of the Thunder Dragon) as is known in Dzonghka, the office language of Bhutan, is only 180 kilometers and (110 miles) from north to south and 325 kilometers (200 miles) from east to west. Think Switzerland with deeper valleys, higher mountains, and only one main road meandering west to east (paving seems to become optional the further east you travel); no railroad, no air travel beyond Paro, the international airport in the west of the country, and no navigable waterways. Although rivers abound, fed by thundering waterfalls from glacier-clad Himalayan peaks, they are better suited for extreme whitewater rafting than commercial navigation. The pass is the only gateway between Thimphy and Central Bhutan. 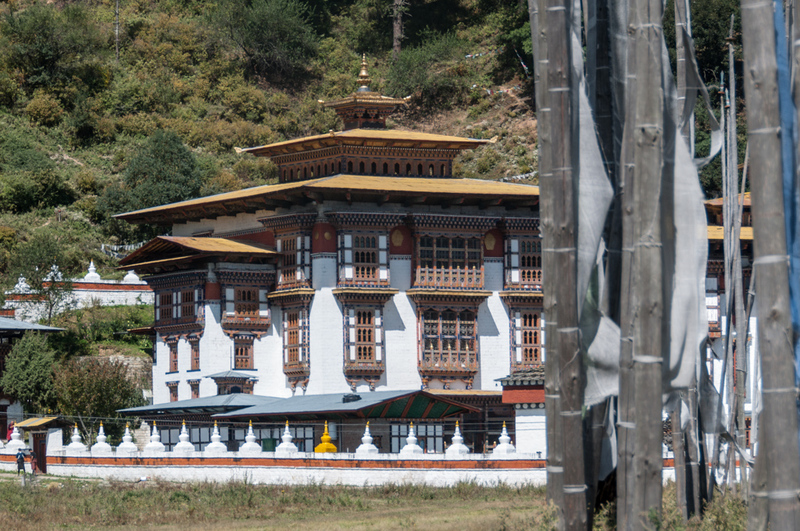 Today we leave the capital, Thimphu, to start our journey eastward into Bhutan’s heartland. It is only 30 kilometers to Dochu La Pass, but the vertical climb from 2,300 meters (7,650 feet) to 3,150 meters (10,350 feet) makes for a slow drive. The only gateway between the capital and the center of the country it is the most visited of the passes, and arguably the most picturesque. When we reach the top, the spectacular view of the Himalayas, “on a clear day” our guide Kesang is prompt point out, doesn’t materialize. We are in the clouds. But this only adds to mystical atmosphere of the place. The hill is covered with chortens, 108 of them rising from the midst. Chortens are religious structures built to honor the memory of eminent lamas or kings or to keep evil spirits at bay, a comforting thought on these roads. 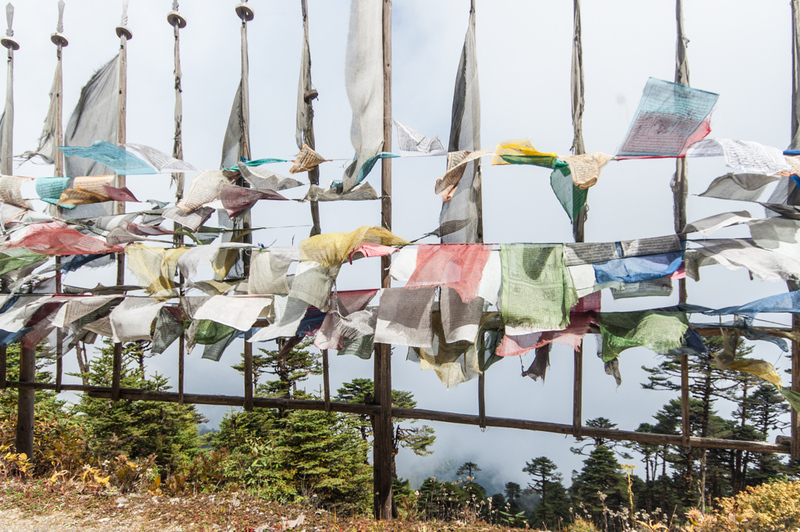 Everywhere around us, giant webs of multicolor prayer flags flap in the wind. The clouds drift apart just long enough to reveal a sunny valley far below us. The Punaka Dzong sits at confluence of the Pho Chhu and Mo Chhu rivers. From the Dochu La Pass the road pitches down toward the Punakha-Wangdue Valley and our main destination for the day, the Pungrang Dechen Photrang Dzong (or Palace of Great Bliss), Punakha Dzong for short. Built in the early seventeenth century, it is one of the oldest and largest dzongs (fortresses housing religious temples, military and administrative offices and monks’ accommodations) in the country. 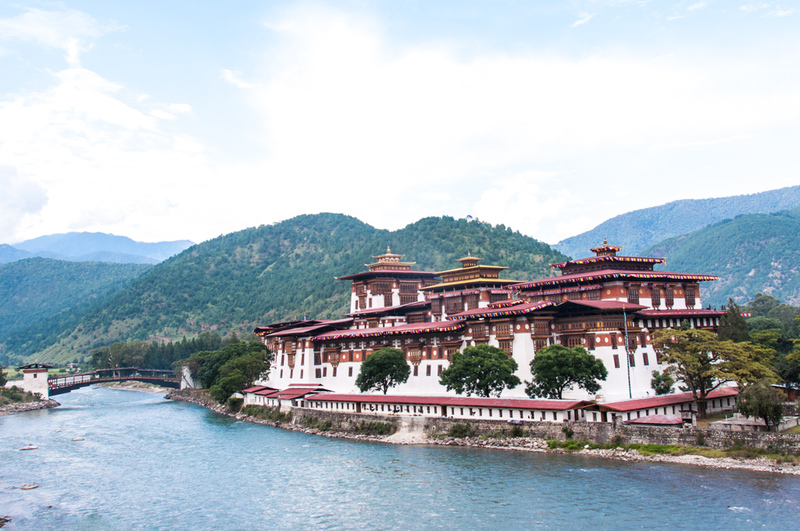 The Punakha Dzong served as the seat of the government of Bhutan until 1975 when the capital was moved to Thimphu. The Punakha Dzong is one of the oldest in Bhutan. Located at the confluence of the Pho Chhu (father) and Mo Chhu (mother) rivers, the Punaka Dzong is a sprawling complex of multi-storied buildings opening onto three vast courtyards and a central tower (or utse). The intricacy of the polychrome woodwork that surrounds all the doors, windows and balconies is magnificent. At the time of our visit the dzong is a beehive of activity as the following week it is to be the site of the Royal Wedding when King Jigme Khesar Namgyal Wangchuck marries his commoner fiancée Jetsun Pema. The complex is being spruced up inside and out and festive buntings hung from every roof and balcony. Cham dances are a form of meditation in Bhtanese Buddhist festivals. We get an early start the next morning. We are off to the Wangdi Dzong for the Festival. 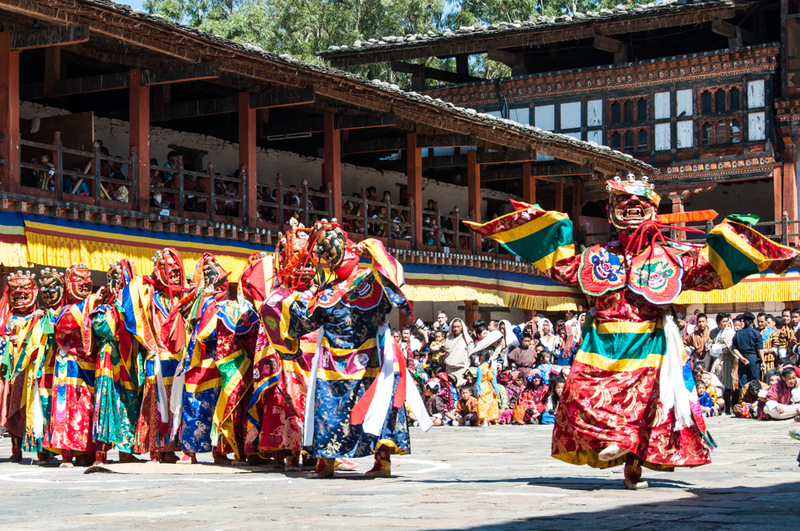 While the underlying purpose is spiritual, the festival is an extravaganza of dances by masked religious dances and dramas pantomimes depicting the triumph of good over evil and stories of the life of Bhutan’s patron saint, Guru Rinpoche. But it is also a great opportunities for socializing and celebrating, attended by throngs of area people of all ages, dressed in their finest clothes. The unfurling of the thongdrel is the closing ceremony of the festival. We are back at the Wangdi Dzong the next morning for the Thongdrel ceremony. 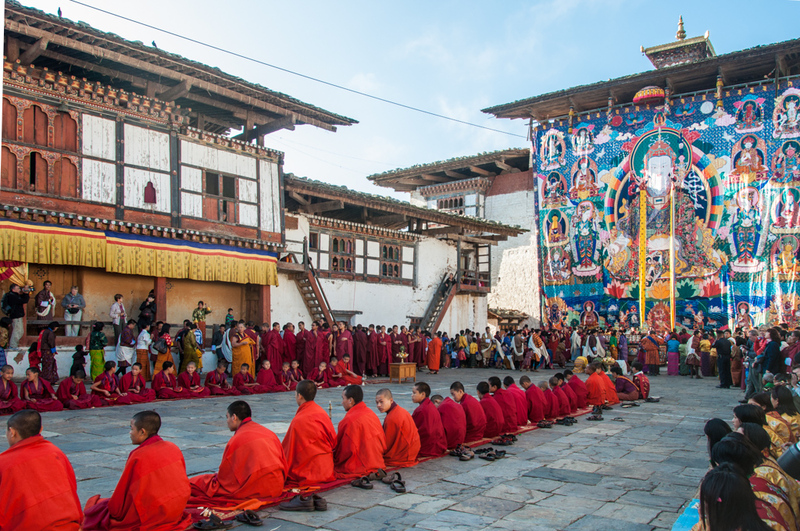 A thongdrel is a giant religious cloth painting that is unfurled from the roof of a dzong into the courtyard. This event only takes place for a few hours on the last morning of the festival to minimize the damage to the thongdrel from exposure to the sun. 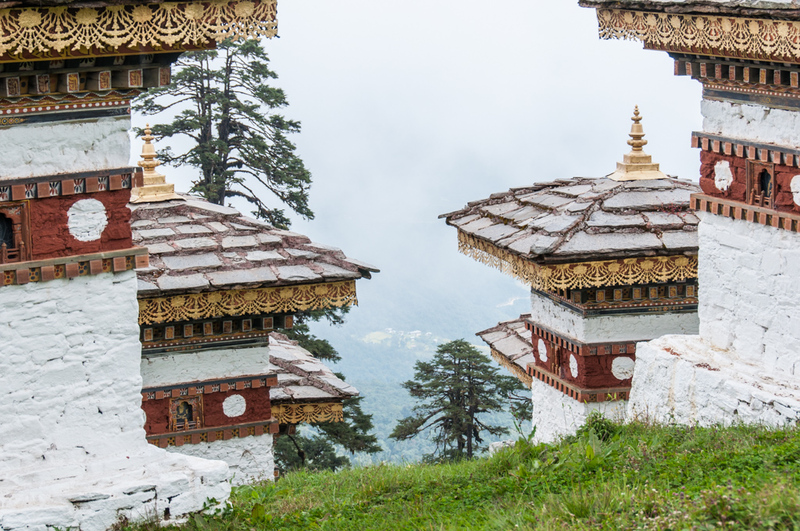 After the receiving the blessings associated with the Thongdrel ceremony, we leave the Punakha Valley and its serene terraces of golden rice paddies and drive to east to Trongsa, the gateway to central Bhutan. Note – June 10, 2013. I was saddened to hear today that the Wangdi Dzong had been completely destroyed by fire on June 24, 2012. Fortunately no human casualties were reported. 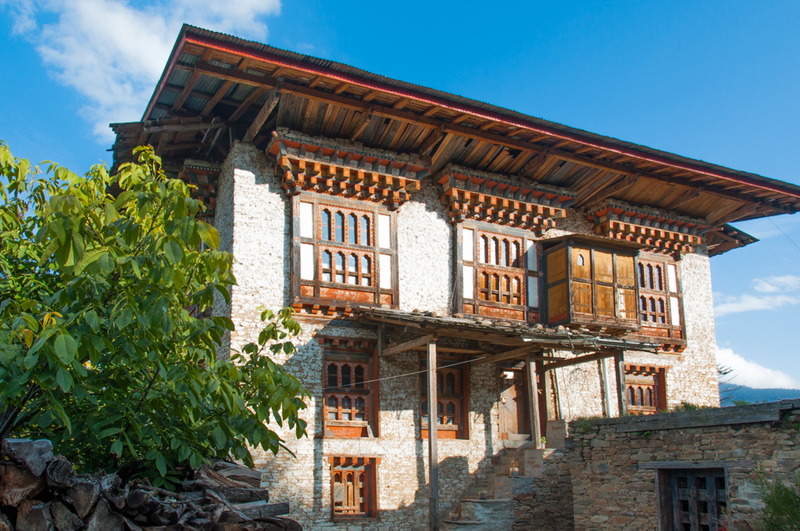 As the Dzong was under renovation at the time, most of the sacred relics had been relocated during the renovations and have been saved. Reconstruction is underway, and is expected to take close to a decade.Thus 2011 Wangdi Festival, which we were privileged to attend was the last to be staged in the historic Dzong.